Off Base Percentage: Brian Fuentes Isn't Good. Or Happy. What did you think of the situation you were placed in tonight? Fuentes: It’s surprising yet not surprising all at the same time. How do you feel with the way the manager has handled you as a reliever? How much communication do you have with him? Why is it pretty poorly? Fuentes: There’s just no communication. Two games, on the road, bring the closer in a tied game, with no previous discussions of doing so. And then, tonight, in the seventh inning, I get up. I haven’t stretched, I haven’t prepared myself. If there was some communication beforehand I would be ready to come into the game – which I was, when I came into the game, I was ready. Just lack of communication. I don’t think anybody really knows which direction he’s headed. In theory, your closer should be your team's best reliever. So Fuentes shouldn't be surprised when his manager calls on him in high leverage situations like being tied in late or extra innings. Or maybe he should since the "closer" role is almost exclusive to save situations now, which Fuentes hasn't exactly been Mariano Rivera with anyway. Geren brought Fuentes in Monday night against the Angels with the score tied 1-1 in the 8th. Fuentes walked Erick Aybar who was erased at second on a Bobby Abreu fielder's choice grounder to third. That was the end of Fuentes night. Abreu stole second and then scored the eventual game winner on a Torii Hunter double off of Michael Wuertz. But Abreu's run belonged to Fuentes and so did the loss. Fuentes has to be frustrated that he's on pace to lose over 20 games but to blame his pitching woes on a lack of communication seems like scapegoating to me. You are a relief pitcher. After being used in tie-game situations recently, perhaps it should cross your mind that you might be called upon during a 1-1 game instead of just mentally preparing yourself to pitch with a 3-run lead in the 9th. Of course, I'm in favor of managers using their best relievers in the highest leverage situations during games. I also don't believe Fuentes is a great reliever (I am, after all, an Angels fan) but Geren doesn't have many better options. Fuentes' 3.16 FIP suggests he isn't as bad as his 5.06 ERA. But his 4.81 xFIP doesn't think that 3.16 FIP isn't going to be staying that low either. Fuentes is one of five Oakland relievers with a positive WAR but at 0.1, he is still basically at the replacement level. I guess my suggestion to all of these players (looking at you too Posada) is shut up and go out and do your job in whatever role your manager sees fit. Sometimes you get pulled off the grill to work the fry station. Deal with it. I think that your opinion is probably pretty stupid, why would a relief pitcher start to get ready when the Manager hasnt asked him to start his warm up? Are relief pitchers now managing themselves? Managing a pitching staff is a collaborative effort, between the manager, the pitching coach, and also in this instance the bullpen coach. Taking your Mariano example, why would Mo start getting ready in the 8th during a tie game? I think what you have here is a manager and player who do not see eye to eye on some decisions and maybe even a personal conflict between the two. Some people just dont get along. Whatever it is Fuentes was a sought after reliever and Oakland needed relief pitching, otherwise they wouldnt have signed him. Oakland dosn't waste money, but somewhere along the way, manager and player havnt been able to get along. Time for Fuentes to move on and see if he can help another team, obviously Oakland must have little use for him. And your article is one way biased towards a manager who hasnt been around very long, nor has he won very much, so your giving him a lot of undue credit. You sure your not related to him? Look at both sides of the situation, before you go out and destroy a player. Fuentes did say he was warm and ready to pitch. So I'm not sure why you think I'm suggesting relievers should take it upon themselves to start warming up on their own. What I do take issue with is Fuentes voicing his displeasure with how he is being used. It is the manager's decision to use his bullpen how he sees fit. And yes, I do applaud Geren for using his "best" reliever in high leverage situations instead of holding him out for a save situation. I personnaly agree, a "relief" pitcher should be able to relieve at anytime. That is why there is a bullpen and they are not napping in the club house. At the same time Garen is a bumbling idiot,the game was tied in the 8th 1-1 not 5-5 and he yanks Outman because he reached 100 pitches. At the very least he should go to the starter see how he feels and possibly send him out there to win or lose. I agree with Rosenthal it is time for Geren to go before the season is a wash. And by the way Beane letting Ron Washington get away is a travesty. Yeah, players do not like Geren. 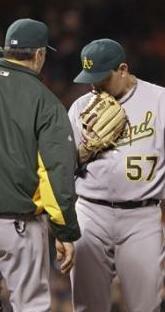 I haven't watched enough A's games to really know how detrimental to the team he is or not with in-game management. But Fuentes handled the situation like a spoiled brat instead of a veteran reliever. This is on Fuentes.